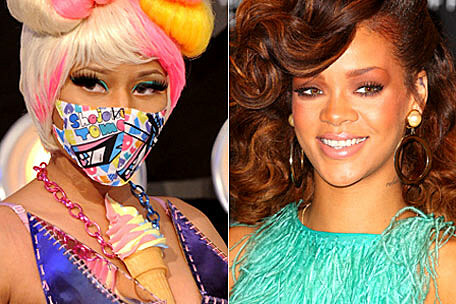 After walking the red carpet at the 2011 VMAs, Nicki Minaj -- dressed in a metallic pink dress, Madonna-channeling pointy bra, ice cream necklace, and multicolored surgical mask, with a stuffed animal hanging from her waist -- showcased a clip of her Rihanna-assisted 'Fly' video. In the black-and-white four-minute clip, Minaj steps out of an expensive ride and into a world of destruction, where it looks like a UFO has crashed and burned. "I came to win, to fight, to conquer, to thrive/ I came to win, to survive, to prosper, to rise/ To fly," Rihanna coos as Minaj, rocking a black wig and pink ensemble, walks around the rubble. Rihanna then joins her rhyming collaborator, donning sleek, long red locks and a black fringed outfit. The Young Money MC raps alongside the pop star: "Cry my eyes out for days upon days/ Such a heavy burden placed upon me/ But when you go hard your nay's become yay's/ Yankee Stadium with Jay's and Kanye's." The Bajan beauty and Queens lyricist change wardrobes once more before all is said and done, RiRi donning a leather bodysuit and Minaj sporting blonde, leopard-spotted tresses.